Is it a full moon yet? I think that the full moon is just around the corner...I'm having a bad week. I just can't concentrate. Thursday was the perfect example of it. We received a shipment of Jitterbug...gorgeous...I should of taken individual pictures and added the inventory to the computer. 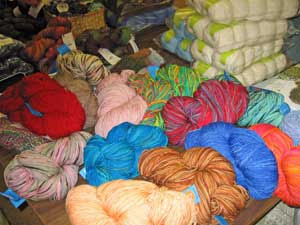 The we received our first shipment of the Amy Butler yarns and book. I should have taken individual pictures and added the inventory to the computer. Then we got the backordered colors of the Namaste Monroe Bags. I should have taken individual pictures and added the inventory to the computer. I did take big grouping shots...that was fun. Then we received the Dimension button trunk show. I did unpack and inventory that and took pictures. Then I blew off what I should have done and just sat done with a project on large needles and knitted and knitted until I went home. 450 Stitches a row . 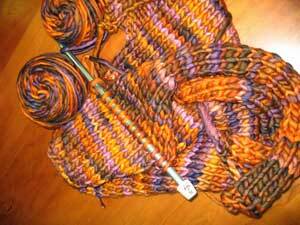 At one time on the Sweet Jazz scarf there are 450 stitches. 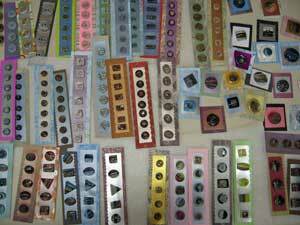 Don't you know...I have 436. I slept on that number thinking that my sub concious would have an explanation and I would wake up this morning ready to fix the problem and finish the scarf today.....Wrong. I recounted thinking maybe I messed up the first time....still 436. I only have to go back 3 rows I am sure but....450(actually 436) stitches ripped on size 3 needles with yarn overs.I do get a little antsy. It is surely not getting done this way. I have vented and now I must tackle the rows and the small needles and the yarn overs and the number of stitches. It occurred to me that maybe I should share how I approached this ripping session with those of you that are interested because I did start with a strategy and plan. First of all I made sure that I had needles on hand that were smaller than the ones I was actually knitting on. I ripped back two rows and then on the third row I took the smaller needles and ripped a couple stitches than put them on the smaller needle...ripped a couple stitches and added it to the other stitches until I was at the end of the row. I counted to make sure that I now had the 450 stitches I was looking for and proceeded to put them back on the bigger needle so that I had the correct stitch orientation . I could have just knitted off the smaller needle but there was something comforting about the whole reorientation process. No, I'm not talking about music when I titled this entry Sweet Jazz addiction. 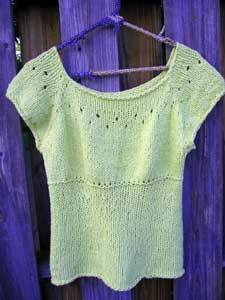 I'm talking about the pattern by Samantha Roshak of KnitQuest. 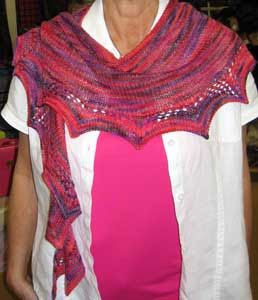 One Thursday, Karen the teacher of our group class comes in with this sweet little scarf/shawl. 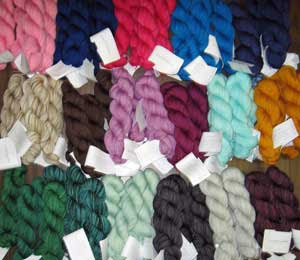 She made hers out of Koigu..there are so many colors to choose from! We were all over it (especially me). I kept showing it to people as they walked in because it is just so classy looking. I finally started one myself. I decided to make mine with Tofutsie because I wanted a lighter weight version for the summer. 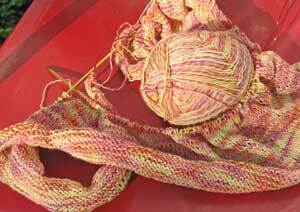 I have been knitting away because I want to see it finished and share it with you. Today you can see it as a work in progress....my goal is to have it done by Tuesday of next week. The pattern is written in an easy to read format and it looks a tad daunting at first but it is really just broken down into sections. Deal with each section as the time comes and you will be good to go. I highly recommend the first section of Sweet Jazz for a social project because the rows are long and you can knit away while chatting. While I was working on mine I realized that I have not made public the fact that Amy Butler and Rown have come out with a yarn line and designs to go with it! We are scheduled to be receiving it any day now. We will keep you posted! Emmaline and musings on the color yellow. So here is my Emmaline sweater, the pattern is free on Knitty.com this season. I totally love the sweater made from the Classic Elite yarn Sprout. 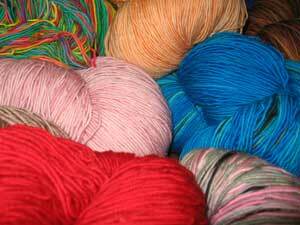 This yarn is cotton, is perfect for the non-cold temperatures(is that a word?) and knits up quickly on a size U.S. 10 needle for most people(come on you know if you knit loose or tight.......fess it up!). Yellow? I'm not sure why I chose yellow. Maybe because I associate it with buttercups and blue skies and laying in fields and staring at the clouds. Maybe it is because the color yellow makes me happy...my kitchen is in yellow and I loooooove to cook...or maybe somewhere I read that yellow is the color of the season. I do love yellow whatever the reason.